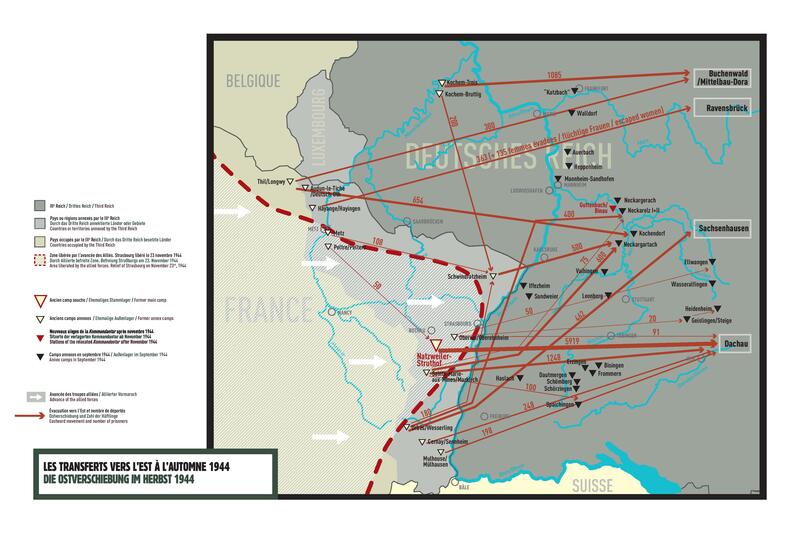 In 1944, after the Allied forces made two landings in France, they headed toward Nazi Germany. 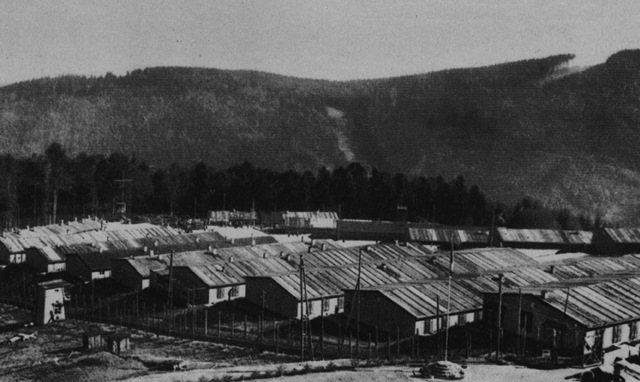 On the 25th of November, they discovered the first concentration camp near the west front: Natzweiler-Struthof. The Allies entered an empty camp – all the prisoners had been evacuated. For the prisoners, this was not the end of their trip through hell. The “Natzweiler camp” was only moved to the east – to the other side of the Rhine River, where the violence continued unabatedly until April 1945. In November 1944, the headquarters were relocated to the Neckar villages of Guttenbach and Binau. 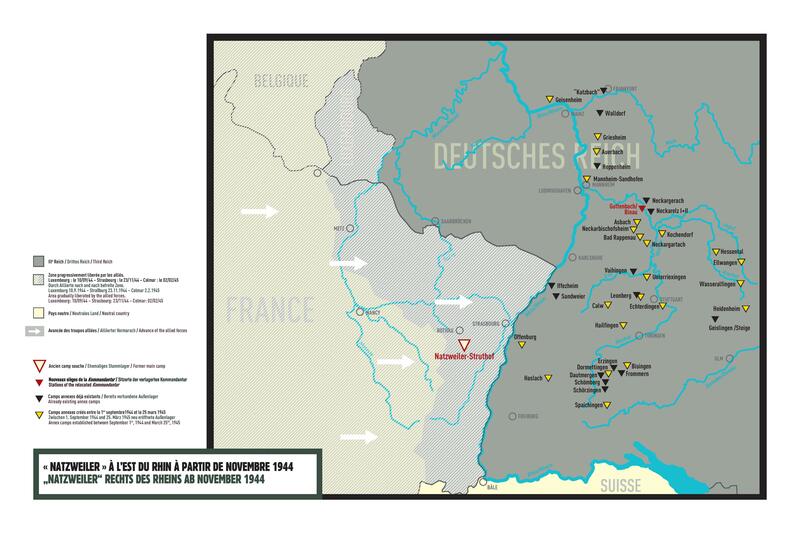 16 existing, and 25 newly opened annex camps east of the Rhine were commanded and administered from these villages. Approximately 20,000 prisoners were newly registered between the 1st of September 1944 and March 1945. Almost all of them worked for the wartime economy. The hard winter, working until complete exhaustion and the lack of provisions only exacerbated their misery. The death rate rose. Those who were unable to work were sent to the Vaihingen camp. This camp evolved into a death camp. While Nazi Germany´s military was slowly collapsing, they somehow managed an astonishing reorganization of the “Natzweiler concentration camps”. It continued to exist as the single main camp within its annex camps. In March 1945, the Allies crossed over the Rhine, and so began the actual end of the “Natzweiler concentration camp”. The annex camps were evacuated, most of the prisoners were sent either by foot or by freight trains toward Dachau. Others were sent to Bergen-Belsen or Buchenwald. They were not to, under any circumstances, fall into the hands of the “enemies”. The transports of prisoners were en route for several days, and despite the lack of provisions they managed to cover a distance of hundreds of kilometers. Whoever fell behind risked being executed. 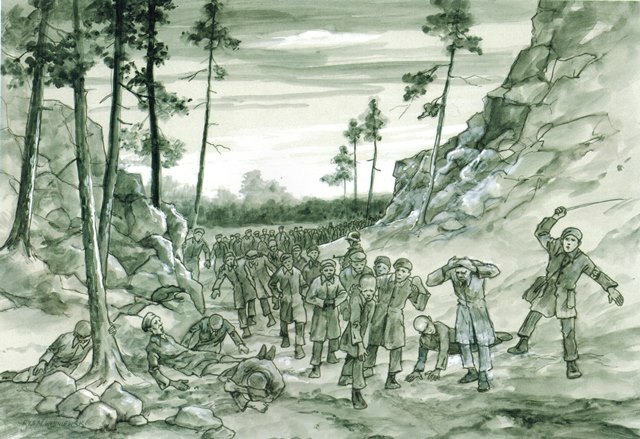 The prisoners used the term death marches due to the high numbers of victims, the constant threats of the SS, but also because of the bomb attacks. The German population, by this point (at the latest), had directly witnessed the suffering and adversity of the prisoners. The dead were hastily buried on the spot. The survivors were liberated either whilst en route, in Dachau, or on further marches toward the Alps. The Vaihingen concentration camp was liberated by the French.